Want to eat en terrasse today? We’re in the process of updating this list for 2019 but you can see our past selections below. Will – There’s a smattering of lime green chairs on the sidewalk at this brand new modern bistro near the Aligre market. Le Square Gardette – A taxidermized haven with a handful of outdoor tables, it’s Bobo paradise on a sunny day. Le Comptoir du Relais – Yves Camdeborde’s beloved bistro, once neo and now classic, has several sidewalk tables. Book months in advance for weeknight, no-choice dinner, or just queue up at lunch or weekends for the so-called “brasserie menu”. Chez Michel – This Breton bistrominique near the Gare du Nord serves a four course feast featuring dishes that are baked in a massive dining room oven. A few outdoor tables are available as well. Chez Casimir – This bustling annex of Chez Michel offers some sidewalk seating along with hearty seasonal cooking and a heavy dose of old Paris charm. Philou – There are a few sheltered seats outside one of our favorite absolute favorite bistros. Chef Philippe Damas showcases some of the season’s best ingredients. La Fontaine de Mars – Breezy indoor/outdoor dining at this perpetual favorite. This mainstay on the crowded rue Saint-Dominique, offers classic cooking with a southwestern tilt. Open every day. 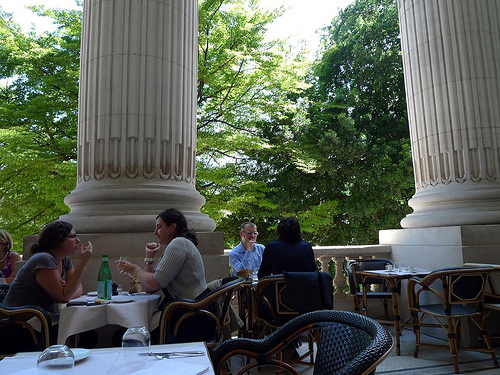 La Rotonde – Snag a sidewalk seat at this classic Montparnasse café and brasserie. They serve standards like onion soup and steak tartare all day long. Le Marché des Enfants Rouges – The oldest covered market in the city is also one of the most unusual. There are fruits, flowers, fish, but more importantly, several tiny international restaurants which serve only at lunchtime. The Moroccan stand with its heaps of couscous and fruit-studded tajines is our favorite. Enjoy a cup of mint tea at one of their tiled tables and soak up some sun in the midst of the bustling market. There’s also a fish & chips station, a colorful French brunch destination, Japanese bento boxes and more. Le Mini Palais – Towering columns, palm trees, spacious seating… c’est la classe. Eric Fréchon of the Bristol is the consulting chef of this contemporary, chic brasserie. 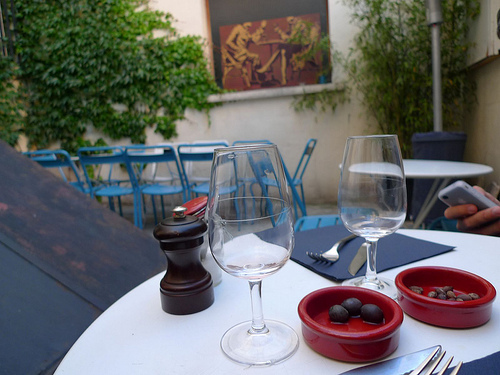 Les Climats – Go for the sweet, shady terrasse (only open at lunch) but stay for the all-Burgundy wine list. La Grand Cascade – Gorgeous forest-side dining at this Michelin one-star in a grand pavilion in the Bois de Boulogne. Laurent – Luxury and history come together at Laurent, where you can dine in the former hunting lodge of Louis XIV or, better yet, at a table in the garden. Fine dining, fine setting. 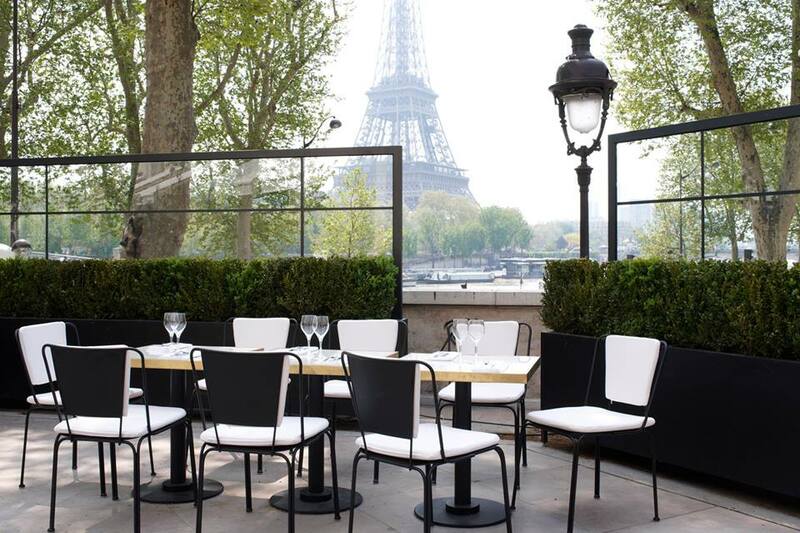 Drouant – A collection of plant-protected outdoor tables, smack in the city center. Facing a very pretty square, Drouant has been around since 1880. Now run by Antoine Westermann, the menu offers elegantly updated classics with an emphasis on seafood. Monsieur Bleu – The food leaves a little something to be desired, but with one of the best views of the Eiffel Tower in all of Paris, the terrace is showstopping. Hotel Amour – Fashion types flock to to this boutique hotel for lunch in the secluded back garden. Rosa Bonheur – The mood goes from picnic to party as the day progresses at this pavillion in the Parc des Buttes Chaumont. Small plates, straightforward plats du jour and drinks. Thanks Ella. If you click on the links for each restaurant, we have a more full description including the average price. Hi Aparna, it’s pretty chilly at night in early November, but there are a few restaurants with outdoor seating that have heat lamps (for example, Le Comptoir du Relais). Thanks for a great guide! It would be fantastic if you gave us a price estimate for each too. Thank you for posting these wonderful outdoor dining suggestions in Paris! Whenever I travel, I love to eat outside, because it adds to the relaxing ambiance of vacations. I will have to be sure to try some of these restaurants if I ever go to Paris. Le Square Gardette could be interesting with taxidermy decorations!